When the time came for Paolo to select the enrichment activities he wanted to participate in this summer, the opportunity to take a coding class jumped out at him. Along with his peers at Davidson Middle School in San Rafael, California, Paolo learned some of the basics of computer programming as part of his summer learning experience thanks to a collaboration between BELL (Building Educated Leaders for Life) and Khan Academy. Here’s how it all works: the school leaders and teachers who deliver BELL’s summer learning programs for scholars in grades K-8 can choose to integrate the free Khan Academy math and coding resources into their summer learning plans, based on variables such as scholar needs and technology access. BELL provides training, instructor guides and resources (such as primers, video tutorials, and sample reports) and ongoing coaching via email and webinars. Teachers, scholars, and parents can all access the math and coding resources, and continue using them after the summer program concludes. In fact, at a site visit at Davidson, Emily Radwin, BELL’s Learning and Assessment Systems specialist, was able to hear from both scholars and staff that many scholars were choosing to work on coding projects at home and on the weekends. 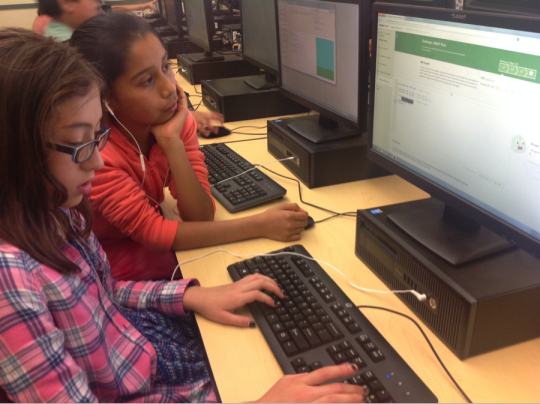 The Khan Academy coding curriculum also allows scholars to work collaboratively in pairs, and has opportunities for scholars to have “free time” and use what they’ve learned to work on free-form coding projects. You read that correctly: the opportunity to learn about computer programming, while also honing their academic skills, motivates scholars and makes them excited to spend a big part of their summer – five weeks, five days per week, six hours per day - at school. Read more about the summer learning scene in San Rafael in this article by the Marin Independent Journal, and learn more about how the math and coding activities work in BELL’s summer learning programs.